We have loved Lily's AB Neptunes, but decided it was time to move to AB's Q90 Naida ear-level processors. Lily's experience and ease of change has been positive. Here are the Top 8 things we like about the AB Naida Q90s. Lily says she could hear at a level 8 (out of 10) with her Neptunes, but can hear at a level 9 with her Q90s. The Neptune programs rolled directly over to the Q90s so the sound is very similar (according to Lily). The ear-level processor wearing hasn't been a problem with the new weight on her ears or keeping them on her head except when she's running or reading upside down. However I can't imagine how you would keep them on a baby or small child. Neptunes are still dreamy for this young population and have fewer parts to break. Lily doesn't turn her head so dramatically when trying to hear in difficult listening situations because the T-mics are now in the center of her ears, instead of the microphone being on the side/back of her head. No more tank tops to hold the Neptune in place and long cords running from the headpieces to the processors. Although she was sad to see the tank tops go. There is much easier access to the Q90s to change the programs or adjust the volume, although Lily prefers set it and forget it. Her programs include a regular program with auto zoom and wind block, duo phone and super stereo zoom. Lily likes the automatic auto zoom feature that "turns on" in noisy situations. She can hear the sound cut out for half a second before it turns on, however the FM overrides this feature when it's on. Three-year warranties for all the components. Lily longs for complete static and waterproof processors. However the waterproof setup of the Neptune totally changed our lives and Lily will still wear them for water activities. The Q90s have a water proof box we could have selected, but we chose to stick with our beloved Neptunes for water. The only battery that has an FM connection is the 170. For Lily, the FM is worn during every school day. The length and weight of the battery and FM receiver becomes quite long, especially on a child. The 170 batteries last Lily about 14 hours, which is close to a full day but sometimes we have to change them. None of the new "mini" batteries are included in the initial purchase of the product. Especially for children, this seems like an ideal product that would be used on the weekends. Lily and Bodie experienced their first Husker Red/White spring game. Feels a little like Where's Waldo. Can you find them on the field? While the sound system in the stadium was really loud, it often times wasn't that clear. Announcements, calls and music should have been captioned for those who are deaf or hard of hearing. Some sports stadiums are moving to IPads where people can follow the captioned action, but I hope that progressive stadiums will figure out Jumbrotron captioning before they are legally required to. Love the innovation of the family who created CIWear, an active wear shirt with pockets for cochlear implants and other electronic devices. Where to put the Neptune processors is a challenge that adults and children face. Especially in the pool, ocean or even during a basketball game, CI users want the processors to be secure and the cords to stay close. While swimming in a pool, we clip Lily's CIs on her sleeve then run the cords up through her shirt. This new active shirt design looks even more secure. Now if it only came in pink! Advanced Bionics has just introduced the Naída CI Q70 (Naída CI) processor, HiFocus™ Mid-Scala electrode, and HiRes™ Optima Sound Processing. With Naída CI, AB brings performance and wireless connectivity and now cochlear implant recipients have access to the combined technologies of AB & Phonak. • Bimodal streaming—media can be streamed to a compatible Phonak hearing aid and a Naída CI sound processor at the same time! In addition to the Naida CI Q70 Advanced Bionics has also recently received approval for the HiFocus Mid-Scala Electrode (designed to protect the delicate structures of the cochlea) and for HiRes Optima Sound Processing (which offers optimized battery life)! We are definitely going to get the HiRes Optima soon for Lily's Neptunes. It's another trip to the audiologist, but well worth such an increase in battery life. Currently, Lily's batteries will die around 4pm. She is starting extracurricular Spanish class this week that, you guessed it, ends around 4pm. So what should I do? Go to school and change the batteries between school and class? Ask the teacher to do it? Or get this HiRes Optima ASAP. We'll also be investigating the Naida CI which looks exciting, although we love her Neptunes. Lots of exciting new options to think about. Exciting new update by Phonak with Roger. "a new digital standard that bridges the understanding gap, in noise and over distance, by wirelessly transmitting the speaker's voice directly to the listener. Available for the education market beginning Summer 2013, Roger is designed to surpass today's Dynamic FM and equivalent digital systems." New information is coming out on Advanced Bionics' new Behind the Ear (BTE) processor. Check AB's website for all the latest details. Also reports of a new HiFocus Mid-Scala Electrode from Advanced Bionics which has recently received approval in Europe. See press release for latest info. I can't believe I haven't posted my amazing discovery about longer-life AAA batteries for the Neptune. Lily wears bilateral Neptunes and also typically wears bilateral FMs all day at school that drain her batteries. We were having trouble with the regular rechargable Duracells making it through the school day. They were also very unpredicatable. Then I discovered Rechargable Duracells - Stay Charged. We now get almost 10 hours of power. These little batteries have changed our life dramatically, as well taken the burden off Lily's teacher. I also see on the Duracell website that they now have a "Quick Charger" and a "15 minute Charger." These might have to go on our next Wish List. Our current charger takes around 9 hours to charge, so it leaves little room for recharging user errors. Ahhh technology! Interesting Advanced Bionics T-Comm review at Cochlear Implant Help. Here's Lily's stay put Kindergarten school hairdo. On most days you don't even see her Advanced Bionics Neptune headpieces. Only the tan wires that go down below her ponytails and into her shirt. I'm fascinated to read some of the blog speculators that are saying, based on patent applications, Advanced Bionics might be working on all-in-one headpiece/processor. Can wait to see where the technology goes. The annual Fourth of July parade was a big hit again this year. Lily was very interested in decorating her bike and used a whole roll of tape to attach the flags. Her helmet still doesn't fit quite right. (Bike helmet company please design a better fitting helmet for CI users) In the mean time, I need to take a hammer and chisel and adjust the foam inside just a little, unless anyone has a better recommendation. This is the first summer Lily has been riding her bike, so she still has her training wheels on. Stop and smell the roses and ask a bunch of questions is more to her liking than get to the next place in a hurry, so the training wheels help as we amble down the road talking about everything. As soon as we can make our way to an American Girl Doll store, Lily would like to get hearing aids for her doll Lanie. How wonderful that American Girl has made this an option. Now maybe we could add an attachment to the hearing aid and turn it into a BTE Cochlear Implant. Thanks American Girl. This is very empowering for our daughters. This week we tested ClearVoice in the car, on a busy street, to understand how it works best. With the window open, the wind was blowing in Lily's face, and she could still hear me talking, actually quite well. This was quite novel for Lily because normally we would always drive with the windows up. Thank goodness for ClearVoice and for beautiful spring days in Nebraska. Last week Lily received ClearVoice, Advanced Bionics' new sound processing innovation that enhances speech understanding. ClearVoice is also the industry's only sound processing technology that has been clinically proven to deliver superior hearing performance in noise. Within seconds of having ClearVoice activated, LIly tested 77% in noise and 100% without noise. This test was done with sentences that were pretty complicated. As the test progressed, it seemed her hearing improved. Lily had a test in noise a year ago and averaged somewhere between 50-70% accurate. We return in six weeks to do a comparison test. During this visit we also had her maps slightly adjusted for some of the higher pitches. We like her to hear around 20db or less on all pitches. Lily's comments about ClearVoice thus far have been that the car seems quieter and the conversations are easier to hear. She's also been picking up the words to songs more easily. We've been using ClearVoice on the Medium setting and are now waiting for a noisy activity to try the high setting. So very very cool and it was free (except for the cost of our visit of course). I've had a number of people with "ordinary hearing" ask if they can use ClearVoice. More great news. Advanced Bionics' ClearVoice has been approved by the FDA!!!! Lily should receive ClearVoice in early to mid-April. Then bring on the challenging listening environments. What difference can an FM make? I'm always interested in how things sound for LIly. This page contains recordings of speech through a Comtek FM system in quiet and in noise, through the FM (on the lapel of the speaker) and/or environmental (on the body of the listener) microphones, at a distance of three and twelve feet from the listener. Multi-talker babble speech noise was presented from behind the listener at a level of about 60 dBA. It is not clear if these recordings are through an additional listening device like a hearing aid or cochlear implant, but the differences are still facinating. Hearing accomodations are becoming mainstream, not only because of ADA but also for good customer service. Check out this recent article in the NYT about hearing loops. Here is a terrific seminar/video on FM technology from Phonak. Well worth the time to watch. It covers everything from SNR to how scores for "hearing in noise" improves as people get older. It also describes those who would benefit from an FM including children and adults with hearing loss (even unilateral hearing loss), people with MS, children with autism, non native learners, those with auditory processing disorders, etc. Restaurants are finally geting it. Helping customers hear in noisy situations is huge. Of course it is in Sarasota, Florida. Older customers = Big business. Here's a story about virtual reality with 3D Audio. This professor has found the musical sweet spot for sound. Think of the potential application in hearing aids or Cochlear Implants. "Surround-sound can give you a sense of an explosion happening at a distance, but it's not accurate," says Professor Choueiri, sitting in his custom-built acoustics lab on campus. "With 3D audio, I can get a fly to go around your head… or if you want to really scare somebody, you can put a sound inside their head." Interesting blog post by XSports Protective on ideas for helmets and cochlear implant use. Also posted this blog post from Funny Old Life on the same subject before, but it has been updated. I hope we're only one or two Cochlear Implant generations away from not having this as an issue at all. Can you tell I'm thinking spring again? After three dance classes, Lily had a dance recital. We had planned to give the FM to the teacher so at least Lily could have some idea what was going on. There was no way to hear anything in a big gym with 20 kids and loud music playing. Because of all the chaos, and the fact that the teacher was standing next to the little ballerinas and not in front of them, I decided to keep the FM. Then it dawned on me. I could watch the teacher and tell Lily the steps. Of course this would be a great plan, if we had discussed it prior to the performance, but this is all new territory for us. I turned the FM on and started repeating the steps. Lily made all the right moves, or at least the ones I knew how to describe. In the middle of the song, the teacher saw that Lily and her "soul sister" were in the very the back of the group, where they couldn't see anything, and quickly put them front and center. It was adorable. For the next song, the FM strategy worked just as well, until Lily says in a very loud voice "Mom - where are you?" She could hear my voice with the FM, but she had no idea where I was in the audience. I whisper that I am in the back under the basketball hoop. She sees me and there were big smiles. I'm sure this won't work as well when she is a teenager. I can already hear her say, "Mom, please get out of my head!!" Lily has taken up dance and she loves it. She gets to dress up, practice her moves and speak french. However, the dancing room is a very difficult listening situation. There are wood floors, cement walls, a big mirror, loud music, etc. There is nothing that helps with poor acoustics, except for the FM. With the FM, the teacher is talking directly to Lily and she is following closer than many of the other normally hearing children, likely because they can't hear the teacher. With the 50/50 split Lily can still hear the music, but her teacher's voice is 50% of the signal she is receiving. Pretty Cool!! Have I mentioned my campaign for better acoustics? Lily has been wearing a Phonak Microlink CI S receiver with a MicroLink FM transmitter during preschool, noisy activities, and therapy, until last week when one of the wires on her receiver pulled out of its casing. I called Faye, our public school Hearing Resource teacher and within two hours, she brought a new receiver to our home. This is AMAZING customer service!!!! THANK YOU FAYE!!! We really appreciate her responsiveness and attention to Lily's needs. Lily never missed a beat and loves wearing her FMs. They make a huge difference, especially in noise. Phonak, the maker of Lily's FMs, now owns Lily's Cochlear Implant company Advanced Bionics. We are looking forward to a next generation Cochlear Implant that combines both of their technologies with out of this world results. I am fascinated with the Proven Benefits of Sound Enhancement Systems. Why doesn't every classroom have a sound system? The quality of teaching is noticeably enhanced as each child responds openly throughout the day to clear, intelligible instruction, regardless of class size, background noise, seat location or if a child has a mild hearing loss, a common daily occurrence at the elementary level. Improves student attention (particularly with ADD students) resulting in easier classroom management, less student distraction, less need to repeat instructions and higher listening skills test scores. Results in less stress for all, and reduces teacher absences due to vocal strain and voice fatigue from a measured 15% down to 2-3% in one year. Overall classroom management is improved markedly, discipline problems are reduced, student on task times are more consistently on schedule, and test-taking time is reduced. Increased student motivation, participation, and speaking confidence results from better hearing, increased speech & language growth, and improved voicing capabilities. Results in improvement in reading & language test scores in the early months, notable for all students at all levels. Statistically significant gains are made in overall composite test scores, evident in less than one full school year, and have been maintained in research study periods for up to three years. Research has confirmed where early K-6 classroom sound enhancement has been introduced, numbers of students placed in special education referrals has been reduced by up to 43% over five year periods. I've posted this CI Theory website before but just went back and found some incredible updates about this guy who has a AB CI and has been using it to work on a next generation CI speech and music strategy. Check out My Biography and Background and Info about Speech Processor and Work. Check this great article out about our friend Cory Honold, fellow Bionic Ear Association mentor, who helped a high school student play football with his CI on in Columbus, NE. Fun adventures at preschool. We're not sure what they are doing, but Lily seems to want to go back. FM was funky today. It worked in the car going to preschool and when I passed it off, but teachers indicated that the screen said FM wouldn't connect with receivers. Teachers tried to reboot, but it wouldn't work. Happened again after I picked Lily up from school and we were sitting having lunch. Had to Sync and reboot. Hmmmm. This is tricky technology. But we'll figure it out. We are wearing the FM on many of our outings now and it is amazing the improvement it makes. Lily's class also got caught in the rain on their hike. But Lily and her teacher covered her CIs as they ran back to the school. All was well. No problems. Lily is going to a second preschool we are calling Nature Preschool. This gives her incredible nature and outdoor experiental learning opportunities. Leaving today was much easier (for me). Lily said "OK bye Mom" and off she went. We haven't gotten much info about what happened yet, except the class was ouside a lot of the time and they weren't allowed to pick anything up on their hike today. Lily also arrived to school with the FM on and the mute button pushed. That way I just had her teacher put the FM on and explained that when she was ready to talk to Lily in a small group/large group she could just unmute it. After the class, her teacher said they spent a lot of time outside, so didn't use the FM much, but that Lily seemed to hear and understand everything. It's really hard to tell. Hopefully our great public school teachers can observe in the next few weeks and offer any pointers on incorporating this technology into the preschool practice. I am going to continue to encourage them to use the FM as much as possible because of the amazing difference it can make. So excited that Lily can have this very cool opportunity. Lily is very excited too and she is ready to go back again. Late summer trip to the Zoo. Of course the Butterfly Garden is a favorite. I wore the FM while at the Zoo and it made a huge difference. It cut the number of times Lily said "What" in half or maybe by two-thirds. I could even turn my back and keep talking with her. And when she ran too far ahead, I could calmly say "Get back here" and she would turn immediately. FMs = Awesome!!! Having a kid with a special need sometimes makes you see things a little differently, such as playing doctor. Lily loves to play doctor and we have a pretend stethoscope, but when she puts it in her ears she says "I can't hear the heart beat." So now when we put them on we say "bump, bump, bump" (heart sound). But...wouldn't it be wonderful if she could hear the sounds? I doubt families with normally hearing kids have real stethoscopes, but sometimes the challenge of "you can't" makes you work harder to change it into something "she can do." I am looking to borrow or rent a Stethoscope (like the E-scope II Amplified Stethoscope or the Cardionics Amplified Stethoscope) that can connect to Lily's Advanced Bionics BWPs with an audio patch cord. Not for long, just so she can "experience" a heartbeat. Can you help make that happen? Last night right before bed, Lily carefully took Melody's (the Advanced Bionics Monkey) Cochlear Implants off and laid them on the dresser. Then she shut her eyes and fell asleep. When she woke up in the morning, the first thing she asked for was to put on Melody's CIs, even before her own. Very cute. Here's an interesting article of brand specific recommendations on how to use FM systems with Cochlear Implants. Understanding the serious drop off of Lily's ability to hear in noise on the airplane, we brought along a direct connect cable ($6 audio cable from Radio Shack) and plugged it from the phone to Lily's Advanced Bionics PSP. Lily was unsure to start, then said it sounded different and now has asked for the cable on a number of noisy occasions. We knew Lily was hearing well right away, because she was reciting the words and songs from her favorite Oswald episode. We have two cables and a splitter, so that will be our next attempt. The CIs are also set on a 50/50 split, so she is hearing 50% phone and 50% environmental noise. So amazing. Found a very interesting, comprehensive and critical narrative comparison of Cochlear Implant brands, including Cochlear, Advanced Bionics and Med-El and all their components. This blogger did some incredible research identifying various aspects of CIs that the corporate marketing materials make hard to uncover. Very cool simulation from Phonak about the power of their Dynamic FM system. In the simulation you can adjust all the sound parameters including ambient noise, speakers voice and distance from speaker. It also totals the SNR - Sound to Noise Ratio, which is increasingly important to understand for kids with Cochlear Implants. New research is showing that keeping the background noise down is so critical. 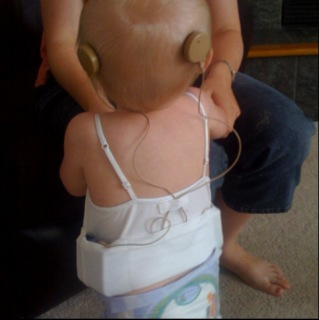 While Lily can hear down to 20dbs in quiet, her hearing drops dramatically in noise. Advanced Bionics is coming out with software called ClearVoice that makes important adjustments for this. While approved in Canada, it is still in clinical trials in the US. Lily is featured in the 2010 Advanced Bionics Calendar "Celebrate Hearing!" Among the beautiful drawings from AB recipients in China, incredible poems about sound, and photos of people doing amazing things with their implants like running marathons or playing in rock bands, is a cute photo of Lily playing outside. "Life is Bliss. When we gave Lily the middle name of Bliss little did we know how truly appropriate it would become. Lily keeps shining, reminding us daily of the gifts that make each day wonderful. She sings. She dances. She talks and talks and talks. She picks up words and conversations. She tells stories about monsters and she tells Mommy how much she loves her. And with each sound she hears and word she utters we are amazed. Thanks AB for making Bliss an everyday occurrence." Advanced Bionics has started a very cool partnership with Skinit, maker of "skins" you can put over your Advanced Bionic BTE Cochlear Implant or computer or IPhone or whatever. Lily can be a Hawkeye one weekend and a Husker the next. Or maybe have butterflies one week and then Minnie Mouse the next. Right now we are sticking to basic tan. In fact, because her hair is finally filling in, we get far fewer stares and questions these days. The headpieces and cords often seem to just disappear into her hair. I am sure in a year or two, Lily will be ready for sparkles and rainbows. When we spoke at the Advanced Bionics headquarters, we envisioned the future for people with CIs. We thought they'd be the lucky ones with "CIA style" hearing. Maybe listening to someone whisper across a huge field? We have always wanted to visit Advanced Bionics since the moment we chose the company's Cochlear Implant for Lily. In fact if we knew it was so easy to visit, we might have journeyed to California much earlier to take a tour, meet the people and see where the magic happens. We were in the area for Lily's Dad's work, so added a few days on to trek to Advanced Bionics which is located just North of Los Angeles. AB has two locations, a factory and a headquarters building, which is soon to become one in a beautiful new facility down the street from their current headquarters. While we only requested a tour, we were invited to speak to the entire company about Lily's hearing journey. AB feels it is important for every member of their company from factory workers to the CEO to hear the CI stories of their customers, both good and those who have had challenges. With this aim, AB invites about 30 customers a year to speak and requires their staff to attend. We were one of those customers to speak to the entire staff in both locations. It was truly an honor, and yet quite intimidating to talk to those inventing, improving and producing products that have allowed or will allow Lily to hear better. We saw it as a rare opportunity to directly impact those who will shape Lily's hearing journey through improved hardware and software. We saw it as a opportunity to directly thank those who made Lily's implants. (They pulled a half dozen people off the floor to meet with us, who in part made Lily's implants.) We also saw it as a time to motivate and inspire the company by demonstrating Lily's success with acquiring listening and spoken language. I'd say we left our visit as "believers." While we definitely identified things we thought they could do better, we drank the Kool-Aid and are so happy we chose AB for our partner in this hearing journey. They even told us and showed us some of the secret stuff they are working on and boy are we excited. There is so much to report about our visit and vacation, we'll have to break it up in a number of blog posts. As they say on TV.....Stay Tuned. We're always on the lookout for up and coming technologies that will make Lily's life easier with her cochlear implants. This often times means looking to Europe or Canada for the latest offerings from the cochlear implant manufacturers. Because of FDA regulations in the US, it often takes longer for these new offerings to make there way through the approval process and to the market. This can sometimes be frustrating - especially for some of these accessory offerings like new battery options or harness options that don't really impact the actual cochlear implant device or the sound processor. However, its nice to know they are looking out for our kids. One of the new devices we'll be interested in taking a look at is Advanced Bionics new off-the-ear battery options that will allow Lily to use a behind-the-ear Harmony processor, but not have the bulk of a big battery on each ear (see picture below). We've heard that the behind-the-ear Harmony offers a lot of advantages (like t-mic options, better positioning to take advantage of one's ear anatomy, and digital sound processing). For now, the body worn processor with the single magnet and microphone combo is really ideal for an active toddler, but we'll keep looking for better. This little tank from Target was re-engineered by the Grandmas to be Lily's Advanced Bionics Body Worn Processor holder. It keeps everything in place and is super comfortable under her clothes on hot summer days. As you can see there are pockets on the sides for the processors, a pocket in the back with Velcro to keep the cords in place and a little flap at the top to run the cords up the center. Works like a charm. Email for exact dimensions.